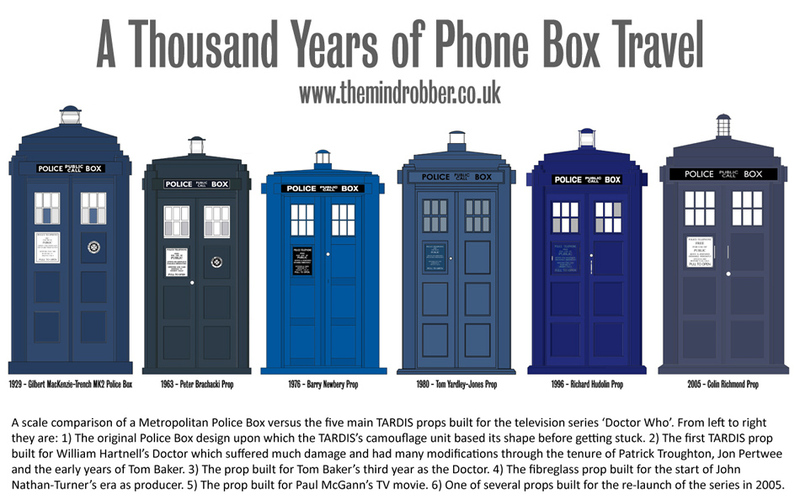 I don't know how many people are really interested in this but I suddenly realised that a lot people Googling 'Police Box History' might be interested in the actual boxes in the real world rather than their televisual counterparts, so I though I'd knock together this quick summary. This article came to be written firstly because I noticed how popular the TARDIS Prop History page is, and secondly because I was a little bit irked when I was listening to The Great Mr Moffat explain that the jibe about the TARDIS windows in Blink was at the expense of the fans who failed to appreciate that the real Police Boxes came in all shapes and sizes. I'm sorry but that's simply not true - there was only ever one Police Box which the TARDIS looked like - and so I decided to write up a web page discussing the matter. It is a curious thing that when I come to write up 'a quick history' of something, the subject, no matter how trivial, suddenly unravels before my eyes into a fascinating, time-consuming nightmare of contradictory information and oft-repeated myths. Whilst reading up on the subject of Police Boxes, I immediately knew I had a problem when three different web sites claimed three different different cities were the first places to use TARDIS-style boxes. Things didn't improve when I tried to find out the name of the man who designed them - because different sites gave him different names, and also different spellings of his name. I started reading about the supposed difference between Mark 1 and Mark 2 Police Boxes, but when I looked at photographs to check these facts I found that none of the information out there was reliable. So I have done my best to unify some theories and assemble some verifiable information. Always attempting to stay one step ahead of the criminal, the Police began to exploit the newly-invented telephone technology with a pioneering network set up in Glasgow in the early 1890s which allowed policemen to stay in touch via signal posts. The earliest form of police signal box had appeared in America in which different codes were dialled for different crimes and sent by Morse Code (dial 4 if there's a riot, or 5 if there's a drunkard...) but the Glasgow system exploited the new telephone technology. The first boxes were eight-sided, pillar-like and made from cast iron. These pioneering creations featured a signalling line, which allowed a trigger from the police station to remotely-operate an electromagnetic lever system that lit a red lamp on the top in order to attract the attention of a police officer on the beat. Sometimes the lamp was actually located away from the box itself, in a high-visibility position to improve the chances of an officer being alerted from further away. Square police boxes were first introduced into the north east in the late 1920s but these were large, short and had a sloping roof. It was following the spread of these shed-like apparitions, that the Metropolitan Deputy Superintendent George Abiss along with Metropolitan Police Surveyor Gilbert MacKenzie Trench took a tour of cities in the north to assess the implementation of these innovative communication posts. With clear benefits to efficient crime fighting and convenience, it was decided that the Metropolitan police would create a standardised design, and to that end Gilbert MacKenzie Trench produced the iconic piece of work which would one day enter common parlance as a 'TARDIS'. They first appeared on the streets of London in 1929. The first version of the Metropolitan box wasn't the precise one on which the TARDIS was based because some details weren't refined until the second version. However, to tall intents and purposes the familiar design had arrived. As to the matter of its construction, some sources (for example the 'TARDIS Technical Manual' and the Kent Police Museum Online History), claim that the Mark 1 Metropolitan Police Boxes were initially constructed from wood, however evidence to back this up is not only suspiciously absent, but seems to be directly contradicted by the documentation available. The original MacKenzie Trench blueprints which are available to view (extract shown above right) indicates the material for the shell of the box is 'concrete'. Furthermore, when one single panel of wood is required for door, it is shaded differently to the rest of the box to indicate a timber component and it specifies that it should be made 'in teak'. In the absence of anything other than anecdotal evidence to the contrary, it seems clear that the Metropolitan Police Boxes like the TARDIS were only ever made from pre-cast concrete, thus rendering the description of the time machine's disguise as a 'wooden box' to be inaccurate. From a social perspective, the introduction of these little police outposts saw an important change in their function. The main difference between the old signal posts and the new boxes was that they could be used by the public. There was no lock on the telephone panel and and the new loudspeaker-telephone system (what we'd refer to simply as a 'speakerphone'), something which was unfamiliar to the public, had an explanatory notice. Due to their modernity, the public were very cautious about making use of these telephonic systems and despite their great number in London, in 1933 a Police Box was used by the public on average less than once per month. This situation led to special exhibits being set up to educate the public and encourage them to use the boxes, and statistics in Glasgow report that total calls nearly doubled between 1935 and 1936. By the 1940s, the Police Box had an extremely important position in society, since most homes did not have telephones and the boxes could be used to report fire, or to summon an ambulance as well as their primary purpose of combatting crime. The light on top of a police box illuminated red and could be activated by the station or by a member of the public to attract an officer. Officers therefore were encouraged to stay within line-of-sight of their Police Box for as much time as possible, although the top of the Police Box lamp contained a gong mechanism which also provided an audible means of attracting attention. A Mark 2 version of the Metropolitan Police Box followed, and it is this version upon which the TARDIS is specifically based. The differences being that the Mark 2 had the explanatory plaque and the St John Ambulance logo moved one panel higher. Another supposed difference was that the original roof sign simply said 'POLICE' on the Mark 1, whereas it was changed to 'POLICE PUBLIC CALL BOX' on the Mark 2, however there are photos which seem to show that the sign on top is not a reliable means of determining the version and some boxes seemed to have a mixture of design features from the two different variants. It is also a fallacy that the appearance of 'hammered' or 'frosted' glass can be used to tell a Mark 2 from the earlier version, because in fact the blueprints for the Mark 1 have written on them 'clear glass in upper panels' and for the lower row of panes it stipulates 'hammered glass in side panels' and 'tinted glass' for the middle. Clearly the distinctive pattern was intended from the beginning, however photos show that in practice some boxes has all manner of variations, including 'hammered glass' in the top left and top right panes, perhaps from refurbishment. The 1996 TARDIS prop designed by Richard Hudolin seemed to pick up on this and placed the 'hammered' glass panels at random in the windows. Most forces adopted the Metropolitan design, although there were variations if the budget was not available to erect these expensive concrete versions, and a collection of non-standard boxes sprung up built in a variety of materials. Some of these boxes were no doubt knocked together in timber and it could be that random regional boxes are the origin of the idea that Police Boxes were wooden. There was also a Mark 3 variation of the Met Police Box which was larger with no windows at the front and three at the side. You can see a map showing the locations of the TARDIS-style Met Boxes on the Police Box Map Site. The Police Boxes which were introduced into Glasgow were essentially the same as the London boxes, but had only three door panels (diagram left). 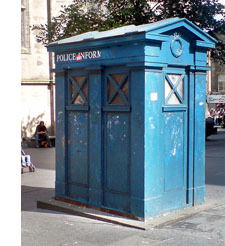 Police Boxes in Glasgow were also red, and were not painted blue until the late 1960s.The network of Police Boxes set up in Edinburgh were a completely different design and many of which can still be seen today. These harked back to the earliest square boxes from the 1920s and had an appearance not dissimilar to a garden shed (shown below right). A handful of original Met Police Boxes can still be seen today around the country, but almost all of them are the Glasgow variation with the three-panelled doors, including those at Avoncroft Museum of Historic Buildings and the one in Kent Police Museum. Glasgow still had ten boxes on its streets in the early 1990s but seven of these were subsequently removed or demolished. Surviving boxes can been seen on Cathedral Square (Google Earth co-ordinates 55°51'43.47"N 4°14'11.36"W) Buchanan Street ( 55°51'37.90"N 4°15'14.42"W), Wilson Street and Byres Road. The Glasgow Transport Museum has one, as does the Summerlee Museum. Perhaps the survival of Edinburgh's 'shed' boxes, combined with the movement around the country of the modified Scottish MacKenzie Trench boxes is partly responsible for the idea that 'all Police Boxes were different' - and might explain the comments of Ed Thomas whose team designed the inaccurate new series prop, or Steven Moffat who said 'there is no way of being right' when creating a Police Box prop. Whilst it is true that there have been many types of Police Box, there is only one type upon which the TARDIS is modelled, and therefore to design a TARDIS prop which ignores the shape of the original is a disappointing decision. Understandably some considerations were made towards practicality and budget when the earliest prop was built at a reduced scale, but the box designed for the new series was deliberately made to look fatter. The TARDIS is supposed to copy a real-life object whose dimensions are known fact - a Mark 2 London Box - so to redesign it to look (in their opinion) 'better' seems somewhat presumptuous and perhaps rather disrespectful towards an icon of British design. I wonder if people would be so nonchalant about the accuracy of the TARDIS exterior if it was made to look like a red telephone box which the designers decided to 'improve' by making it shorter and much fatter. To demonstrate the half-heartedness of the designers down the years, here is a scale comparison of a Metropolitan Police Box versus the five main TARDIS props built for the television series ‘Doctor Who’. From left to right they are: 1) The original Police Box design upon which the TARDIS’s camouflage unit based its shape before getting stuck. 2) The first TARDIS prop built for William Hartnell’s Doctor which suffered much damage and had many modifications through the tenure of Patrick Troughton, Jon Pertwee and the early years of Tom Baker. 3) The prop built for Tom Baker’s third year as the Doctor. 4) The fibreglass prop built for the start of John Nathan-Turner’s era as producer. 5) The prop built for Paul McGann’s TV movie. 6) One of several props built for the re-launch of the series in 2005. The Matt Smith era of Doctor Who features a new TARDIS prop which is almost identical in dimensions to the one used between 2005 and 2009, but with a repaint to resemble the Peter Cushing TARDIS prop. One of the very few Mark 2 English Metropolitan Police Call Boxes (i.e. the exact Doctor Who style) can be seen fully restored at the National Tramway Museum. Go and see it!